As a destination to celebrate our first marriage anniversary, we had chosen Phuket as the treasured corner of the world. This was the place where we were to spend the day cozying up to each other away from the world. As planned, we landed at the Phuket Airport on the afternoon of May, 11th 2016 – the day on which we began our new life exactly a year ago. We went hand in hand towards the exit in the excitement of embracing the calm serenity of the beach destination. Located about 100 kilometers south of Bangkok, Phuket is the largest island of Thailand. Swanked by the Arabian Sea and Indian Ocean region, the island is famed for its natural beauty, relaxed way of life, calmness, and distant hustle. It has today become the most popular tourist destination in South-east Asia. Besides the rich natural heritage that Phuket enjoys, there is an equally bustling nightlife that abounds here. The city is prominently a night city and wakes only post noon and stays awake until post-midnight. Shops and tourist areas are open until late at night as are the restaurants and shopping malls. The city overall is a perfect destination for a relaxing vacation amidst nature and fun. As we exited the airport, we found the MakeMyTrip representative waiting with our name tag waiting to receive us. We were moved into our hotel transfer and we started our journey towards the hotel which was some distance from the airport. After about an hour and a half’s drive, we entered the driveway of Holiday Inn Express – our abode for next three day. The outlook of the facility was impressive as it stood tall on a wide road leading up to the beach, hardly a few yards away from it. The hotel was located in an ideal location amidst the local fanfare, besides the lane of tourist shops and near other spots of tourist interest. The hotel itself was a limited service facility with no bell boys or room service. The in-house restaurant only serves breakfast – complimentary with the room. We checked into the hotel and moved to our room – 7408. The building housing our room was located towards the rear end of the premises and had other resorts in the view. We settled in the room and freshened up to shed the tiredness of the journey. After some snacks and coffee, we left the hotel for a stroll across the beach. The reception provided us with a detailed map of the island and marked key locations on the map for us. We walked across the road to the beach and saw the corn vendor baking fresh corns. The temptation could not have been overlooked, and we headed straight to the vendor counter. The hot corn with cool sea breeze was a wonderful combination. We walked by the sea water and covered a couple of kilometers of the Phuket’s Patong Beach absorbing the rich natural beauty and long views of the sea. On our stroll back we chose a relatively silent spot to settle down and spend some moments amidst the evening view of setting the sun. After about an hour in the perfect setting, we headed back to the hotel. On our way back, we picked some snacks, coke, and bakery from the grocery store so that we are stocked for late night fun. After dinner, we took another walk by the touristic spots to experience the nightlife of the effervescent town. Next morning, we readied ourselves for a trip around the city on a half-day tour. The tour was preceded by a heavy breakfast at the hotel post which, we began our shared tour. The tour began with a general introduction to the city and its various aspects. 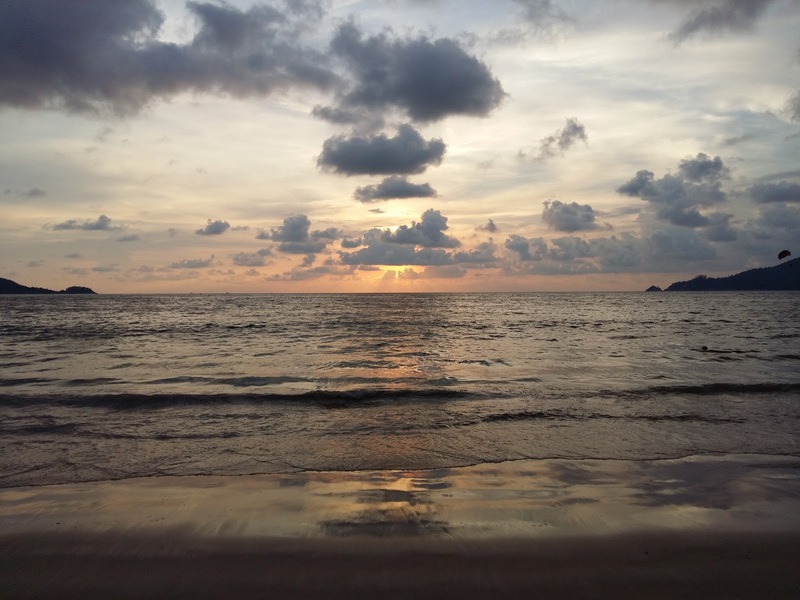 It took us on a drive through the entire stretch of Patong beach, Karon beach, and Kata beach. Out first stop on the tour was the Karon View Point or Three Beach View which provided an unobstructed view of the three beaches – Karon, Kata and Kata Noy beach. Noy indicates a smaller extension of the main beach which generally is relatively less rushed. We spent about half an hour at the location trying various poses and pictures to capture the rich natural beauty. Next point of attraction where we stopped was the activity center which provided numerous options to tourists for experiencing nature. The center offered elephant rides through the forest, animal shows, and ATV riding thrill. We chose the ATV option as it was something we had not tried earlier. We had a chance to take the sturdy ride through rough terrains, designed for the safety of tourists. The thrill of speed, bumpy turns, and dusty air – all combined to give us a never before fun experience. By the end of half an hour ride, we were content, gushing with adrenaline and longing for more. However, one has to realize that there is a point when one needs to move on and so did we, to our next point of interest. We passed through the Sino Village, a local Thai traditional community, which showcased the life of rural part of the country. While the bigger cities have adopted the modern style of life with worldly luxuries, the traditional life is to be seen in such villages. Next, we saw the Muay Thai Boxing Camp. Muay Thai is a traditional martial arts form in Thailand and is a popular sport. The furious punches, crushing elbow strikes, lethal kicks, and artful feints have gained acknowledgment across the world. This particular camp was especially important because of its history in locality and importance in providing a platform to local budding artists. After about half an hour of the drive across the roads on this island city, we finally stopped at a religious center – Wat Chalong. The Grand Pagoda dominating the temple contains a splinter of Lord Buddha's bone and is officially named Phramahathatchedi-Jomthaibarameepragat. The pagoda is decorated with wall paintings depicting the Buddha's life story and also features various Buddha images. Take your time in the pagoda; it is a breezy, cool location and one which is very popular with visitors to the temple. The top of the four-floor building providing mesmerizing views of the town along with a clear view of the Big Buddha, which is another popular location amongst tourists. One must be careful of the traditions and beliefs while visiting such places of religious interests and local devotees hold them very close to themselves. One may be required to remove shoes at some places or may need to wear a sarong or scarf to enter some places. It is important to take such requirements sportingly as a respect to local beliefs and not take them as an offense. We also bought some refreshments at this place and refilled our water stocks as the sun was attempting its best with scorching heat waves. The spot we visited next had a charm of its own as the places offering such a chance are limited in number. We visited the Tiger Kingdom of Phuket which had tigers at various lifecycle stages – from newborn kids to large cats. Now, I know there are these cats in every zoo across the world and many tiger reserves. What made this collection of tigers special was the relative location of the animal and spectator. Every other reserve has some kind of separation between man and the cat – either one of them is in a cage. However, here, we were guided into the tiger enclosure and were asked to be friends with one. We were allowed to play with the head of the cat family and the tiger graciously took pictures with us, in multiple poses. While initially, we had our apprehensions, we eased out to our host as time passed. The over half hour we spent with them, it was a thrilling and exciting time. Once we left the Tiger Kingdom, the tour took us through a gem factory which showcased varied types of gems based on the sources and kind of water the shell was found in. Post this we went to a souvenir shop to pick some memorabilia. This marked the end of the tour and we returned to the hotel for some rest after the long hectic day. In the evening, we went back to the beach to enjoy some good moments over waves and snacks. Later we had a sumptuous Indian dinner at a local restaurant named “Tantra” – a well laid out place in traditional Indian colors and them providing an option of ground seating cushions. Before ending the day, we had a chance to enjoy the fish massage at one of the outlets. It was a different experience, tickling fishes working their ways towards your relaxation. Next day on 13th of May, we had planned a Phi Phi Island day-long excursion. The tour took us through 4 islands in Krabi region providing glimpses of the aquatic life and clean beaches. The speedboat ride through the Indian Ocean region and snorkeling in deep seas was definitely a high point of the visit. The day-long trip was exhausting yet fun. I would cover the details of the tour as a separate post. After returning, we went to a good Thai restaurant attached to Araya Resorts where we had awesome noodles and spring rolls over live music and great views. Post the dinner we spent leisure moments by the hotel pool and enjoyed our time together. The last day in Phuket was marked with mixed feelings of leaving a great destination for another city to be covered on the trip. We woke up early to catch onto whatever time we had in the town. We went for yet another beach walk – this time, to absorb the morning view of the sunrise and the early inactivity in this town which by no means was an early riser. After the walk we packed our bags and checked out of the hotel, ready for our transfer back to the airport. We spent about an hour at the airport, checking into the flight, passing the security checkpoint and window shopping. Phuket’s is a relatively small airport housing a limited number of shops and servicing a limited number of flights every day. For the size of the airport, the rush was definitely more than what it was designed for. Finally, the announcement was made and we boarded our Thai Airways flight to Bangkok.